Summer Grill Spice Blend for all your summer BBQ needs! Use it on everything from corn on the cob to steak to fish! And don’t forget the burgers! The great folks at Kyocera sent me a Ceramic Grinder Mill to try out, and I absolutely love it! First, I love ceramic blades for everything from knives to veggie peelers (if you don’t have a ceramic veggie peeler you need to get one soon! ), so I was really excited about this mill with a ceramic blade. Ceramic doesn’t rust like some metal blades, and it lasts a long time. The glass container on this mill is dishwasher safe, a huge plus in my book! And, you can adjust the grinder to have a coarse or fine grind. The glass container of the mill is large enough to hold everything you want in a spice blend, so you can add multiple flavors and fun goodies in one blend. But, the container isn’t so large that you’re buying multiple case loads of spices just to fill the container. But, what really surprised me was the way the mill fit so well in my hand. The grinding mechanism feels good in the hand, and is easy to turn. I don’t have arthritis in my hands (yet, and hopefully never), but I have a few friends who do, and I’d bet that this would be easy for them to use because it feels nice and smooth. Of course, the most fun with this spice grinder mill is that you get to put in all kinds of blends of herbs and spices. I have lots of fun ideas for this! Mexican blends, Italian blends, maybe even a blend with coffee! Just don’t put nuts or large items in it. The first Spice Blend I’m sharing with you is a really classic blend that’ll go well on just about any summer grilled food. I based this blend on my husband’s world-famous Steak Rub Blend. He puts his Steak Rub Blend on burgers (both veggie and meaty), steaks, fish, just about everything. And, he’s even been asked to bring it to other people’s BBQ’s, so you know it’s great! For this Summer Grill Spice, I got a peppercorn blend without pink peppercorns. Pink peppercorns are from cashew family, and anyone who has a nut allergy may have a reaction to the pink peppercorns as well. I first read about this from Christina’s Cucina, here in this post. I found it to be very interesting, and informative, and if you have family who has nut allergies, I highly recommend you take a look at her post. Since we have several friends and family members who have nut allergies of varying severity, I figure it’s better to simply avoid pink peppercorns in my spice blend, and that way I don’t have to worry about who gets which spice blend. Once you mix up your spice blend, you’ll want to grind it on everything! I might even just put this grinder mill on the table so we can top lots of stuff including dinner with this blend! And thanks, Kyocera, I love my mill! 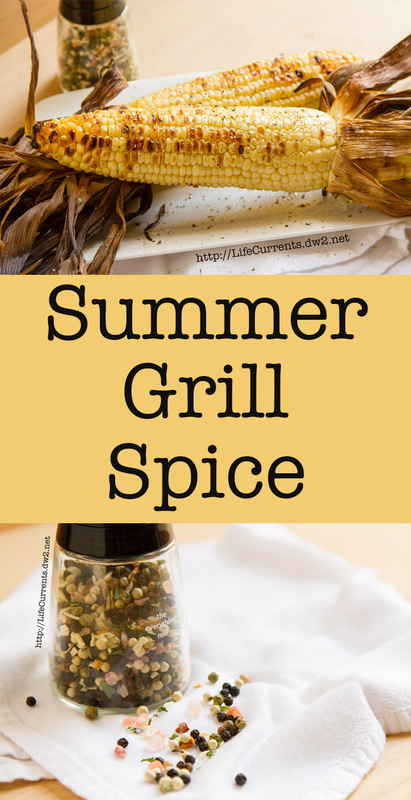 Summer Grill Spice Blend for all your summer BBQ needs! Use it on everything from corn on the cob to steak to fish! And don't forget the burgers! Use the servings slider to easily adjust the ingredient amounts. Mix ingredients in the grinder base, and grind seasoning onto your summer BBQ items, like corn on the cob, burgers, steak, fish, veggies, etc. I have a Kyocera ceramic knife and it’s fabulous, so I was interested to hear about the mill. Hmm… I might need to put it on an Amazon wish list. Since you put large salt in your mix, maybe I need two — one for pepper and one for salt. I just went to their website and the have a dual mill — even better! Only one thing on the counter when you’re cooking. Thanks so much for helping spread the word about pink peppercorns to nut allergy sufferers, I truly appreciate it as many companies refuse to label their packaging with a warning. That Kyocera grinder looks fab, as does your corn!! I LOOOOVVEEE corn on the grill! This corn on the grill looks fabulous! I just so happened to have some sweet Iowa corn. And I love this spice mix idea. That grinder looks so easy to use!!! I love the combination! Can’t wait to try it out. I love making my own spice blends and yours sounds fantastic! On my must-try list for sure! I love grilled corn. This recipe would be a wonderful way for me to cook it. I love grilled corn. I really like the spice you added to yours. I had no idea pink peppercorns were in the cashew family and my niece has a nut allergy. Thank you SO much for the info – and a great spice blend! I love your spice blend and that mill looks so handy!